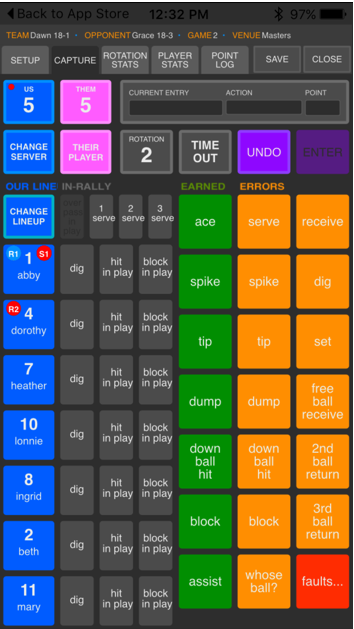 Our first volleyball stat app and still a workhorse. ​SoloStats 123 Basic and Pro are now completely FREE for taking stats. You can stat an unlimited number of matches and teams without ever paying. We backup your SoloStats data to WebReports where you have 20 different reports, national Performance Benchmarks and you can export to Excel, Maxpreps, Presto Sports, Hudl and TeamSnap. Purchase the Starter Bundle to extend your reporting access. SoloStats123 is our original app and requires a tablet or large phone for taking stats. In comparison, our newest app SoloStats LIVE has a revolutionary design that uses a smartphone interface to increase the speed of entry by allowing you to "touch type" with your thumbs. 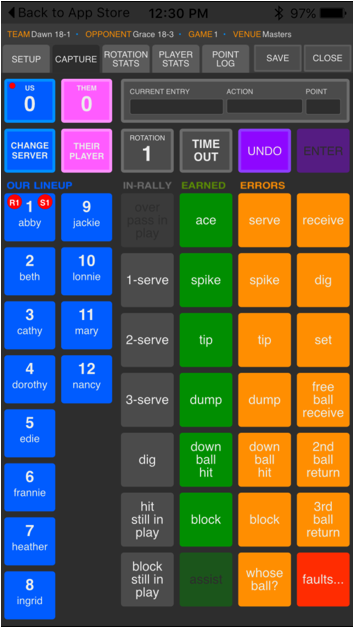 It is the fastest stat entry app for volleyball and is 2-3 times faster than any other app in the market. It's easiest to use on a phone but will run on a tablet as well. You can continue to use SoloStats123 but if you track in-rally stats and have advanced stat taking requirements, we highly recommend that you move to SoloStats LIVE. If your device is connected to the Internet, now you can now Broadcast Live to other coaches and fans. Provides all the key stats you need. Both end of rally and in-rally action. All the features of basic, plus Fast In-Rally mode that puts only the players who are active on the court and makes in-rally stat taking much faster. Also include Capture Screen swipe up to see summary Match Stats in game. The same ease of use as SoloStats Basic but much faster for capturing in-rally action.